The E3 and LaFrontaine Teacher of the Year Awards recognizes exemplary school programs and outstanding teachers. 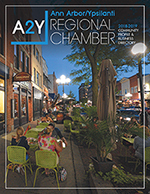 The purpose of this program is to promote business and community growth and development by promoting educational programs designed to strengthen and expand the skill level and income potential of all within the Ann Arbor and Ypsilanti area. This program recognizes educational programs and/or educators in the local K-12 schools (Ann Arbor, Lincoln, Willow Run, & Ypsilanti) that deserve to be emulated in other K-12 schools. Not a Member? Please contact our Business Development & Membership Department to register for this event.